Welcome to our first installment of OSEmail. Now is as exciting time for us - since our TEDtalk last year the GVCS concept has really taken off. We now have remote replicators in China, Italy, Guatemala and beyond, all building our machines and adding improvements along the way. As a subscriber, we'll be sending you weekly updates on the strange and wonderful happenings here at Factor E Farm. This is where we live, build and test our open source machines. We'll also keep you updated on how our machines are spreading around the world. We are proud to announce that CEB 4.0 has been constructed in our first ever large-scale collaborative production run. It took four days, seven people and a ton of steel. We anticipate streamlining the process using the experience from this production and incorporating the use of our upcoming CNC Torch Table. 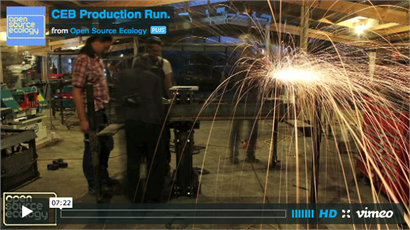 Our next goal is to complete a production run with 8 people in 8 hours. Click for the related blog post, video of the build, or the wiki page with all the specific nuts and bolts. If you are unfamilier with the CEB press, see our previous video for an explaination. In partnership with Manuel Aguilar (TED Global Fellow) and Andres Botran (Food Security Secretary of Guatemala and Aspen Institute Fellow) we are building the LifeTrac and CEB Press at Ingenio Santa Ana, the largest sugar refinery in Guatemala. Andres is the President of the refinery, which employs 60 engineers, 200 mechanics, and has an industrial machine shop. His team is reviewing our designs and enhancing them so they can be distributed throughout the countryside. Together, we are preparing fundamental industrial tools for mass deployment directly to thousands of rural Guatemalans that work for the refinery during the harvest season. Once the machines are ready, training programs will be offered that teach entire communities to fabricate, use, and service them. Our hope is that this pilot is successful and joins a constellation of knowledge and technology distribution options we have at our disposal to accelerate the emergence of the open source economy.